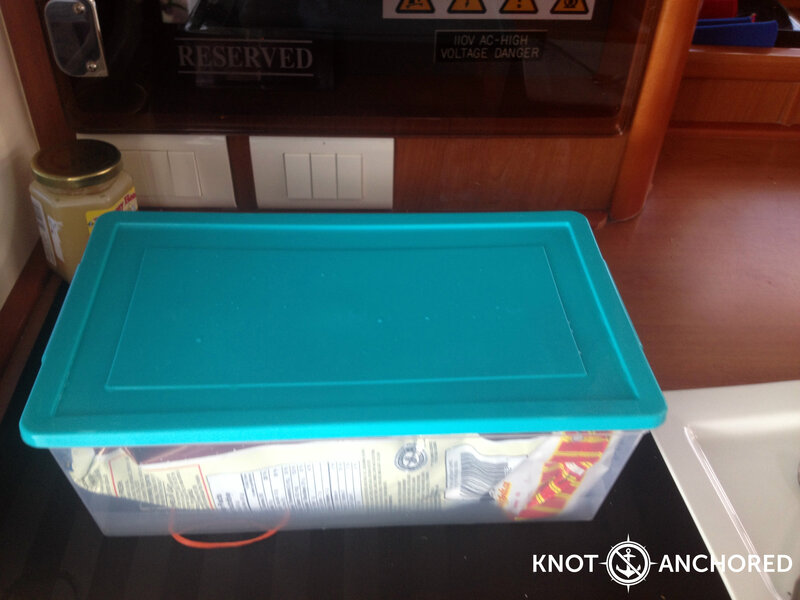 This Tupperware found it’s way from Thunder Bay ON Canada and was delivered via dinghy to Knot Anchored.Last year around November we met some fellow Canadians at Nanny Cay Marina, BVI. They too have a catamaran, 40 Below (aptly named huh). We hit it off and exchanged contact info. It was at that time that they mentioned they were heading back home for a visit and is there anything they could bring back for us. We said no but thanks and then it came to me – ketchup chips! Ketchup chips are my thang and I hadn’t had any for about 4 months and it didn’t look good going forward either as they are readily available absolutely NOWHERE here. Truly it was said in jest as I never really expected anything. I’m pretty sure they were thinking we’d ask for maybe medical supplies or something, I don’t know just not snack food! Fast forward to the end of February 2015. We have guests aboard who bring to our attention the fact that some guy in a dinghy is following along beside us. The waters were pretty rough that day and I was doing my usual scope of the salon, trying to catch any shifting objects. I go out and see said ‘guy in a dinghy’ and then I come back to continue catching rogue items as they slide to their demise. Maybe he’s going the same way we are – it was weird but my head wasn’t computing this situation yet. So I go back out and yup, he’s right alongside now just getting slammed with the waves. 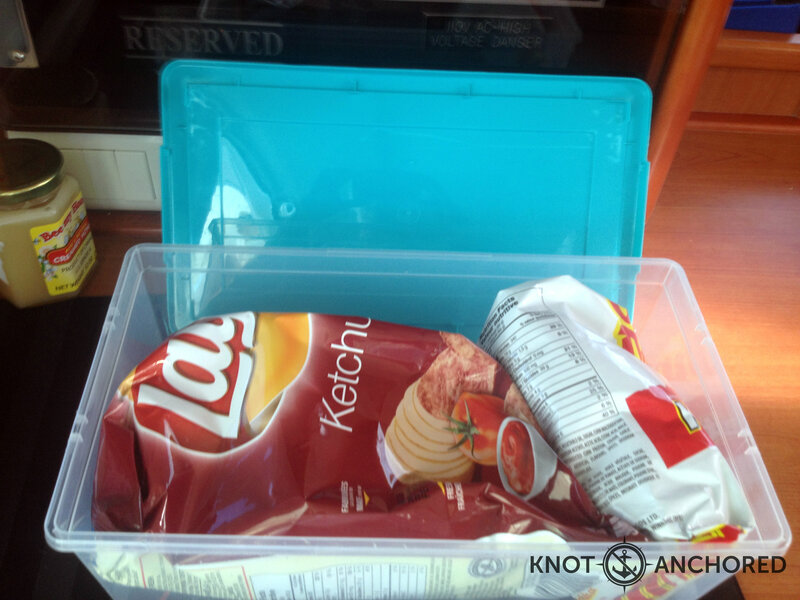 He holds the box up in the air and yells KETCHUP CHIPS! Well I start jumping up and down like a contestant on the Price is Right squealing OMG YAY Ketchup chips HOLY COW!! 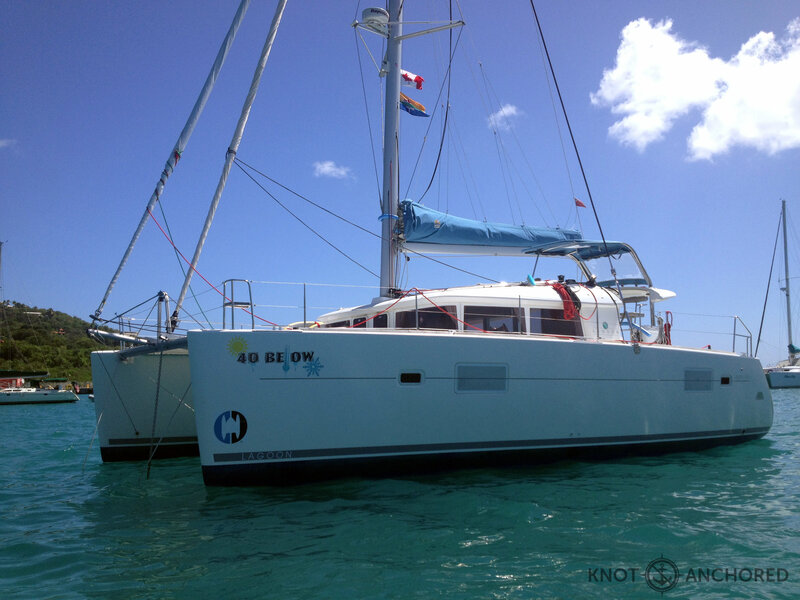 We did the trade dinghy to catamaran. As you can imagine our guests were like ‘what just happened here’? There were even 2 brands, really you never know what the preference is for ketchup chips as both Lays and Old Dutch have completely different recipes. The guests were like ‘ok whatever floats your boat I guess’. Never would have thought…but here they were! They were as delicious as I remember 8 months ago. On a side note I tried to get my son to bring some popcorn ketchup flavored seasoning over with him this last visit and they actually confiscated it. We don’t know maybe they wanted it too lol! Next We had such a wonderful time! Any chance of Peeps down there? OMG I saw Peeps at the grocery store last week!! Purple AND yellow! Then I thought nah they’re just gonna melt so funny you mentioned them! !